Fellowship is a team Ministry – your help and involvement is always welcome for however much or little time you have. During the year St. Francis organizes or hosts many special events and fundraisers. Watch our bulletins and enewsletters, and search our calendar for upcoming events and dates. If you think you might enjoy working with a fun group of people to help organize food, drink and other preparations for events at St. Francis, then contact fellowship leader Mary Deley to find out more! 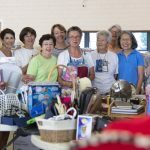 The St. Francis Antique Show is sponsored by the Episcopal Church Women (ECW) – read full details on our Groups and Classes page. St Francis loves clearing out our closets, and then shopping at the annual rummage sale, which is traditionally held in late summer. If you donated items, bought something or worked before during or after the sale this year, we thank you! We had our best year so far – bringing in over $12,000! Can we top it next year? Watch our bulletins and enewsletters, or check our calendar for upcoming dates. For questions, contact: Gloria Jones.